Election of officers for 2010––We will elect officers for the coming year at the next general meeting on October 27. The Nominating Committee has met and presented a slate of candidates as reported in the “Notice of General Meeting and Election of Officers for 2010” below. The general meeting starts at 6:00 PM. Come and bring a dish to share at the potluck. Invite potential members as guests and introduce them around. Are you ready for Soup Night? Plan to come to our third annual Soup Night fundraiser on November 6. You can buy tickets at our meeting on October 27. Why not be a Docent? We still need Docents to help at the History Center. Please see Lois Frazier to sign up for a couple of hours on a Sunday afternoon. Have you paid your membership dues? If you haven’t paid your annual membership dues for 2009, please mail your check now or see Trude Vasquez at the Registration Table at the general meeting. In the meantime, continue enjoying the beautiful autumn weather we are blessed with here in Fair Oaks. The San Juan High School Alumni Association is beginning preparation for the High School Centennial Celebration in 2013. The Centennial Committee will be presenting their plans for the celebration and what alumni of the High School can do to help. 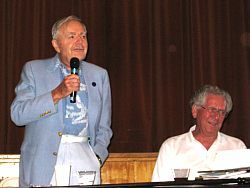 Recap of July 2009’s Program: I would like to thank LCDR Ted Robinson, USNR, XO, PT 118, Ron 6, and his wife of 50+ years for coming to July’s meeting. Ted talked about his experiences in the Pacific during WWII, the part he played in the rescue of JFK, and what it was really like on the Pacific front during the war. Ted explained life as a member of a PT boat crew fighting to prevent supplies from reaching the Imperial Japanese Navy. These men lived in conditions without clean water, little food, poor shelter, but they had a mission and because of them, we live in a democracy. Ted’s book “Water in My Veins” (The Pauper Who Helped Save a President) sounds like a great read to learn the history of WWII on the Pacific front from someone who was there. Ted not only shared his story from the Pacific, but his personal story of growing up during the roaring twenties, and being the poorest kid that ever went to Duke. His book is a true story and a real history book about growing up in America and serving in the Navy during WWII. November 6th is fast approaching. Tickets are selling quickly so if you haven't purchased your tickets yet contact a committee member or stop by Oaks Hardware or Dianda's. Tickets are still just $25 for adults and $10 for children. The doors will open at 5:30 pm and close at 8:00 pm. This year we'll be serving soup from 6:00-7:30 pm. Like last year, we'll be selling wine by the glass and also by the bottle. Just a reminder that no outside alcohol should be brought into the event. Additionally, you can reserve a table if you purchase 10 tickets or more. Like last year, we'll have 5 soups to taste along with salad, bread and cookies for desert. We have some new potters helping us with the bowls as well Don Yost. Thank you again, Don! And we'll be selling some aprons with our logo for $15. Members of the Soup Night Committee will be wearing them at our October meeting so you can see how lovely they are. And remember there is more than soup. Don't forget our awesome Silent Auction. If you have a Silent Auction item you'd like to donate please contact Marilyn Pearce @ 916.961-8415. If you'd like to be a volunteer and help with the event, please call Sallie Miller at 916.967-8482. Let's make this Soup Night the best ever. See you there. Historical Moment: Lois Frazier shared with us a diary page from her sister’s diary dated June 28,1932. It told of an accident, when Lois fell out of the car, she then shared the whole story. Fortunately, she wasn’t hurt too badly. Program: Sherry Wood introduced Commander Ted Robinson. Ted shared with us his recollections of Jack Kennedy as a person, with whom he served during the war. He also shared other stories of the war. Treasurer’s Report: Treasurer Joe Dobrowolski reported that we have been paying our bills. Joe also reported that we have moved our funds for a better return. Past President’s Report: Warren McWilliams reported that the History Consortium will meet at the end of the month. Ken Steen will attend the meeting. Kitchen and Amenities: Warren Blomquist thanked everyone for the wonderful food tonight. He said that 114 plates went out. Membership: Trude Vasquez reported that 60 still have not paid their dues for the year. The envelopes sent out in the newsletter were successful. History Center: Lois Frazier showed the certificate of appreciation for the Memorial day celebration. She needs docents for the fall months. Soup Night: Lyn Steen reported that the plans have been coming along fine. She announced the committee. Tickets are on sale tonight. Volunteers are still needed. Family-Life Membership: Individual Life Membership has been recommended for Mary Jean Jordan. It was moved and seconded to accept this Life Membership. Motion passed. The certificate was presented. Nominating Committee: The following people were elected to the Nominating Committee. Bob Brugger, Ralph Carhart, Bob Vogel and Trude Vasquez. Lyn Steen moved that we accept all four. Seconded by Marilyn Dupray. Motion passed. Hugh Gorman asked for a date of the construction of the amphitheater. On Sept. 19 the annual Chicken Festival was held in Fair Oaks. After a very successful breakfast hosted by the F.0.-Orangevale Grange in the Community Clubhouse, our History Center was open to the public. We had 28 people sign the guest book. Many people indicated they were unaware of the Historical Society and the History Center. 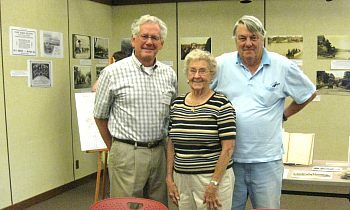 The F.O.-Orangevale Library celebrated their 100th birthday on Saturday, Sept. 26. We were asked to provide a program on the history of Fair Oaks. About 30 pictures were enlarged and mounted on the walls, along with a written explanation of each. The CD of our book "The Early Years" was viewed on their large screen several times during the morning. Our brochure and Walking Tour map was also available for visitors. The following people have been docents this year. Fran Sargent, Lois Frazier, Jean Applegate, Gordon and Joan Heidt, Larry and Meg Smart, Marguerite Goddart, June Melvin, Cheryl Welch, Jim and Marilyn Pearce, Ralph & Sherrie Carhart, Bob & Maria Brugger. Thank you very much!!!! The history center is open every 2nd Sunday from 1:00 to 4:00 pm. It's been a busy time for the Webmaster. We're helping the San Juan High School Centennial Committee with their history project and website. We created the display and helped set up the presentation for the Library Centennial. And, a number of research projects have led to clarification of Fair Oaks history and revisions to the Chronology of Fair Oaks History on the website. Specifically, we've revised the history of the Bridge and Library, and since there's not enough room in the newsletter to print them, they're up on the website. By the way, let's hear it for the old Fair Oaks Bridge. This year is its centennial and it's held up well for 100 years. For the whole story, check out the website. We received an inquiry as to what happened to the Fair Oaks Train Station. I won't go into details, but many thanks to Bob Brugger for helping me with that one. And, Bob ought to know - when he was drafted into the military in 1965, it was there; and when he returned in 1967, it was gone. According to Bob, it was torn down, and the fixtures and lumber were sold, given away or stolen. 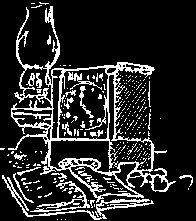 Lastly, since members who missed a general meeting don't get to know what happened until three months later when the newsletter comes out, we will be publishing the minutes on the website as soon after the meeting as they are available. This is another article honoring the old homes of Fair Oaks that were destroyed by fire. This story comes about because of the fortuitous discovery of three seemingly disconnected items and a little detective work. 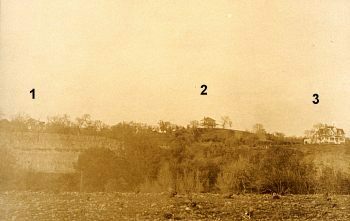 The photo above of the Fair Oaks bluffs was found in the California Historical Society in San Francisco. 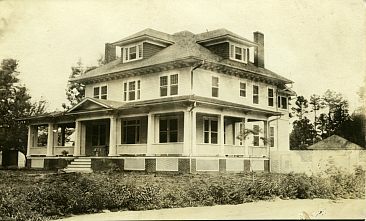 It shows three of the early mansions built just east of Fair Oaks Village in about 1901. On the far right is the Straith home (3) at the south end of Earnscliff Ave., and on the far left is the second story of the Hodge home (1) at the east end of Capitola Ave.. Both are still standing. Behind the Straith home is an imposing mansion (2) which no longer exists. The second item shown above is a photo post card in the Fair Oaks Historical Society collection. It shows a home, which we had not previously identified, labeled "The Willis's house, a very large three story house." This house bears a very strong resemblance to the Bailey mansion in the photo of the bluffs (much enlarged), and we have seen no other Fair Oaks homes, or photos of homes, which are similar. 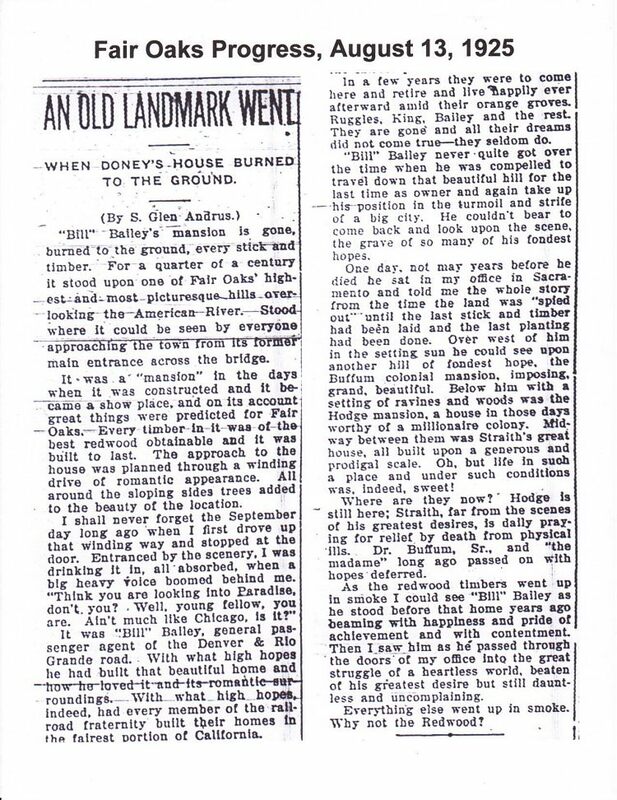 The third item is the newspaper article shown on the following page, discovered while doing other research, that writes about the burning of the Bailey home in 1925. It's a somewhat melancholy piece, but gives an interesting view of Fair Oaks history. Research on the census shows that a Clarence Willis lived between the Rose and Tropper families in 1930. The Roses lived at Ramona and Toyon and the Troppers bought the Straith home, so the Willis home shown in the post card is in the right location. Other evidence suggests that after the fire, the property was in the hands of investors who built a caretaker cottage where the Bailey mansion once stood. The cottage was added on to during subsequent years, and significantly enlarged and remodeled after 1980 when the property was subdivided. The remaining mystery is, who is "Doney" in the article. We can find no reference to a Mr. Doney in Fair Oaks historical records. Could it be that "Doney" is a nickname, possibly for a Mr. Donahue or Donald, or maybe a Donald Somebody. We don't have an answer for that. If anyone has any more information on that issue, or on the Bailey house, we'd love to hear from you.